Exams are an important part of life and some degree of accompanying stress is unavoidable. In fact, a small amount of stress can be an excellent motivator – there is a reason we have evolved to have a stress response after all. But managing exam stress isn’t easy. Left unchecked, exam stress can have a powerful, albeit temporary impact on a student’s mental health and emotional wellbeing. It is therefore important for students to develop techniques to help them manage their stress. The following tips are an excellent starting point for anybody experiencing or expecting exam-related stress. and makes managing it a whole lot easier. There is evidence to show that heightened levels of adrenaline, the hormone that causes the physical symptoms of stress, lead to enhanced memory formation. In simple terms, the more emotional an event, the more vivid our recollection of it. This is part of the reason why traumatic events can affect people so powerfully long after the event itself. Exams are important, which is why they are so stressful. But that stress can work to your advantage. course, and you will find that it becomes much more manageable. Revision is a tricky thing; the techniques that work for one person don’t always work for others. Some people find that re-reading notes and previous work is enough, while others need to re-write them in order to make them stick. Experiment with revision techniques and find the one that works best for you. Begin by making a list of all the subjects that you need to revise. Once you have worked out how you will divide your time between subjects, you can then work out exactly which topics you will revise in each session. Your schedule should reflect whatever works best for you. Some people prefer to do lots of relatively short revision sessions, others prefer to do fewer but longer sessions. Similarly, some people find they need to take regular breaks while others prefer to get into a flow and then work for a longer period. What’s important is that you set yourself a revision schedule that is realistic and useful. It needs to be realistic so that you can stick to it, and it needs to be useful in that it needs to give you enough time to sufficiently cover each topic. You might find it helpful to look at some example revision schedules online, just remember that your revision schedule needs to work for you, there is no right or wrong approach in making yours. While alcohol has a negative effect on memory, caffeine has a number of purported benefits for revising students. However, the evidence for caffeine’s memory-enhancing effects is mixed. It definitely isn’t something that you should be relying on to help you. Our relationship with caffeine is a complex one. Caffeine is a psychoactive drug and an addictive one at that. Caffeine can affect sleep for hours after consumption, so you should aim to give yourself a good 8-12 hours between your last cup of coffee and your planned bedtime. Getting sufficient sleep is also essential for memory formation. If you are a daily coffee drinker, you may need to adjust your consumption. Note that caffeine is physically addictive and that if you suddenly and dramatically reduce your intake, you may well feel withdrawal effects. These can inhibit your ability to revise effectively in a number of different ways. If you think you need to make a dramatic adjustment to your caffeine intake, do it gradually. Try to keep your caffeine consumption to the mornings only and stop drinking coffee at midday. If you don’t have a dedicated area in your home for working and revising, make one now. The more organised you are, the easier you will find it to slip into revision mode when you need to. 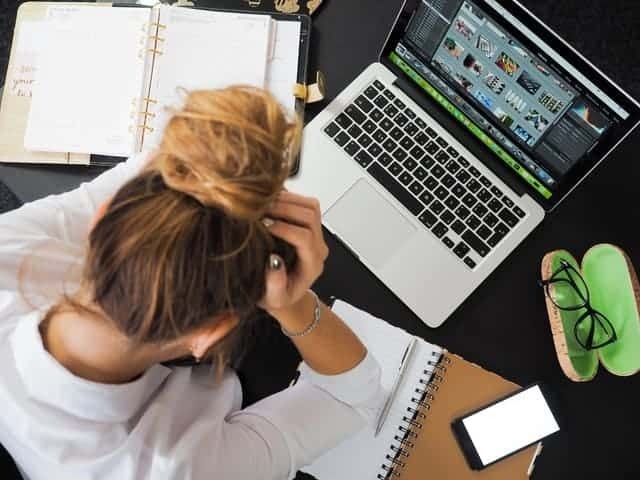 Psychology obviously plays a huge role in exam stress and some of the most effective tips for managing exam stress are those that appeal to our psychology. If you try to do your revision on your bed with Netflix on in the background, you may well feel you are being productive, but it is almost always more effective to work in silence and focus entirely on your revision. If you aren’t used to working without any background noise, it can be difficult at first. If you are only able to focus for 15 minutes, then restrict yourself to 15-minute revision slots. You can always try and extend your revision time as you get used to your routine. One of the more under appreciated aspects of managing exam stress is maintaining an overall healthy lifestyle. Ensuring that you are eating properly and exercising regularly will improve your cognitive functioning in a number of ways. They are also both essential factors for ensuring your brain responds appropriately to stress. Let’s start with your diet. You don’t need to carefully micromanage every meal in order to maintain a healthy diet, but you do need to ensure that you are getting everything your body needs. If you haven’t really thought about your diet before, don’t worry. Maintaining a healthy diet is easier than many people realise. A healthy diet doesn’t mean giving up the foods you love either. In fact, food can be an excellent stress reducer when you need to relax and reward yourself. Just make sure that you include plenty of fruit and veg and try to cut back on the amount of sugar you are taking in. There is evidence to suggest that sugar might inhibit your memory of revision sessions. Most of us are far too quick to make excuses for the lack of exercise we do. One of the most common excuses we use to avoid exercise is a lack of free time. However, exercising enough to make a measurable difference to your health is much easier than you might think. For example, if you live within walking distance of your workplace, you can easily net yourself a good chunk of the recommended 30 minutes of walking a day. You can also invest in some simple gym equipment without breaking the bank. A simple set of dumbbells opens up a whole plethora of excellent strength and muscle building exercises. The act of exercising is known to reduce stress, but there are also several ways that exercising can indirectly make you less stressed. During exercise, when you exert yourself strenuously, your brain releases endorphins. Endorphin is shorthand for endogenous morphine, which is exactly what endorphin is. It is a powerful, yet natural way to relax, and is a big part of why exercise leads to an improved mood. However you go about getting your exercise, even if it isn’t particularly strenuous, ensuring that you are getting sufficient exercise every day will dramatically reduce your overall stress levels. Whether it’s Facebook, Reddit, Instagram or any other platform, social media is the ultimate distraction and time waster. Until your exams are out the way, it might not be a bad idea to delete your social media apps (you can always reinstall them later). If you think you lack the self-control necessary to stay away from social media, removing the apps can remove the temptation entirely. Remember, the better prepared you are for your exams, the less stressed you will be. There is growing evidence to show that social media has a detrimental effect on many people’s mental health. Coupled with it being a distraction, this means social media is doubly bad for your exam prospects. If you find it difficult managing without your social media accounts, try reminding yourself that it is only temporary. Once your exams are out the way, you will be free to spend as much time as you like tending to your social media accounts. As with your revision itself, the most effective routines for dealing with your exam stress will be unique to you. You may need to experiment with different techniques and routines in order to find what works for you. Some people are more prone to feeling the effects of stress. For these people, medication is sometimes the best option. Psychotherapy and counselling can be helpful for anyone struggling to deal with stress. There are plenty of things you can do for yourself that may be just as helpful. Do you have a particular strategy or tip for keeping exam stress at bay? If so, let us know in the comments.